UCT bus set ablaze as students fight over fees! 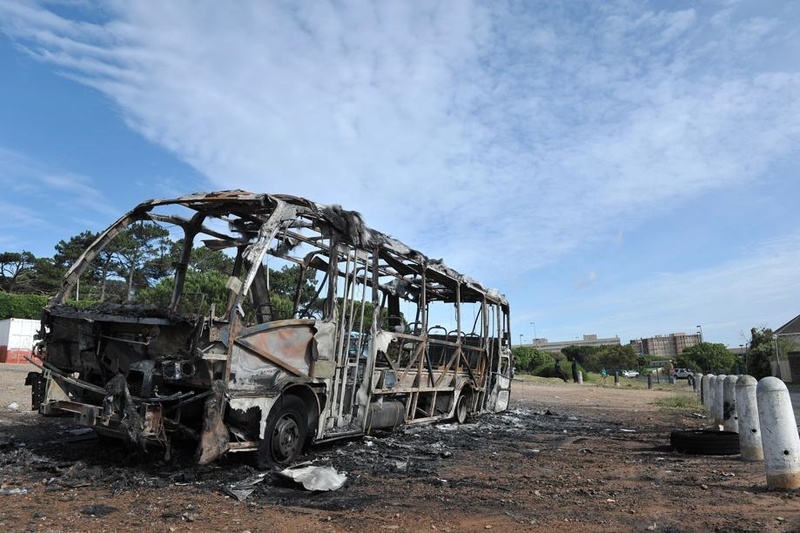 A STUDENT bus was set alight in Cape Town yesterday morning. At this stage it’s not clear whether the Jammie Shuttle at the University of Cape Town was petrol bombed while it stood parked at the side of Matopo Road near the university. The university is one of many across Mzansi where students have recently been protesting as part of the #FeesMustFall campaign. Over the past few days, students and workers have been demanding better working conditions for employees. Yesterday the other Jammie Shuttle buses seemed to be operating normally as they picked up students to transport them from residences to class. University spokeswoman Gerda Kruger confirmed the incident. “The fire department quickly put out the blaze but the bus was destroyed. “The bus was empty and parked at the depot at the time. She said the Jammie Shuttle timetable was not affected but anyone affected by the incident should call Charmaine Dublin on 021 650 3732.